WATCH OUT! This post contains mild spoilers for The Witcher 3: Wild Hunt and its expansion, Hearts of Stone. Read on at your own risk. Geralt of Rivia, the Butcher of Blaviken, Gwynbleidd. A man so cool they named him at least six times. Infamously powerful slayer of monsters and layer of mistresses. Everyone likes him–outside the Witcher universe, away from all that bald-faced racism–so I shouldn’t be surprised that I’m rather fond of him myself. But there’s a spark of something more, a deeper connection to the character which I’ve been finding both curious and elusive in the hundred or so hours I’ve spent with The Witcher 3. On the surface, Geralt is a ruggedly handsome adventurer with a sharp sense of humour and token world-weariness, like so many that came before him. Scratch that superficially familiar skin off, though, and you find a man who struggles with the day to day. A man who knows that fighting hellish beasts from the darkest pits is easy, and talking to humans is a nightmare. Real world, now. Have you heard about social anxiety? Beyond common fear or dislike of people and social situations lies an endless terror, a gnawing certainty that you are a fraud, and that the next time you have to open your mouth or walk down the street people will figure it out. Everyone is looking at you, all the time, judging, cataloguing your failures. I have it. People you know probably have it, but they spend every waking moment performing elaborate tricks and complex social gymnastics in order to prevent you from figuring it out. Right now, one of them is pretending to be sick for an entire day to avoid making a five minute phone call. The Witcher does not suffer from social anxiety. He is anti-social, certainly, and not particularly talkative; he doesn’t seem to like people in the traditional sense. But he’s a functioning adult who could order pizza any time he wanted. Still, his actions often mirror those of a sufferer, and that alone makes him something of a refreshing anomaly in the world of wham-bang-pow video games. If you’re the sort of everyday somebody who deals with mental illness–anything, from mild anxiety to full-blown depression–then you’re unlikely to find a kindred spirit amongst gaming’s leading roles. It’s bravado, confidence and flawless banter all the way down, usually with a functioning social life only impeded by the burning down of villages or uncalled-for slaying of loved ones. Play an adventure game, sure, they’re full of lovably broken banana peels, but action heroes are less awkward and more homicidal. Partway through Hearts of Stone, Wild Hunt‘s first expansion, players are tasked with giving a ghost a good time by allowing him to possess Geralt and make merry at a friend’s wedding. It’s one of the more light-hearted and enjoyable quests in the game, with the false Geralt causing all manner of offence and mischief as he blunders around the party, carousing with women, chasing pigs, drinking, and losing at cards. Aside from all the jokes and Swayze-esque Ghost Dad shenanigans, I found the whole experience rather melancholy. Vlodimir von Everec, the spook puppeteer, is a charming, gregarious sort of chap, suspiciously likeable for a man who openly brags about his Clockwork Orange life of violence and violation. As such, his interactions with NPCs are a far cry from Geralt’s stoic disinterest; Vlodimir jokes around, he offers unsolicited advise to the married couple (and propositions the bride), he boasts about everything, and he talks about his emotions. As if it isn’t bad enough having emotions in the first place without going on about it. The Witcher is understandably miffed by being forced to say and do ridiculous things in public like this, even more so when it becomes obvious his lady companion, Shani, is actually quite happy to be temporarily wooed by someone who probably murdered more women and children than a fleet of bloodthirsty Vikings. At certain points he even has the bloody cheek to insult Geralt from inside his own body, insults which Shani happily goes along with for the sake of banter. Okay, okay, I’m calm. But here lies the crux of the issue, and where the interplay between character and player gets a little more complicated. For most, Vlodimir is an amusing annoyance. Even if you hate parties and think your spirit chum is a complete waste of ether, you’re probably just having a rather fun time with the whole experience. Suffer from social anxiety, and this party is a distorted reflection of your life. On one hand, Vlodomir is a manifestation of everything you aren’t, a fun-loving, socially-functional human being who can mingle with strangers, dance with pretty people and make spontaneous speeches, to hell with the consequences. On the other hand, he represents what the socially anxious player could be, if it weren’t for this pesky mental illness. He’s a reminder of shortcomings, a living, breathing neon sign telling you how badly you’re failing. If only you didn’t have this anxiety hanging around your neck, you could be the guy or girl everyone loves, instead of the one that fades into the background. Geralt endures this torture in synchrony with us. He hears discussions about his social inadequacies just as we do, and does his best to deal with them. Off and on, Vlodimir jumps out of Geralt’s body, at which point the White Wolf is given a few bits of dialogue in which to express his displeasure. In these moments, Geralt is hamstrung by limited options and forced to either play along or make a half-hearted attempt to tell Shani he feels put upon. Out here in reality, social anxiety similarly limits ones options by designing crippling fear right into the system. You want to tell everyone that they are jerks for being mean to you, but then you’ll just look even more dull and awkward than you did before, and you’ve already made it clear you don’t care, thanks to that carefully cultivated mask of cool-guy apathy. Frown and complain, and people will use that to tear you down even further. So, like Geralt, you sit, and stew, and mutter. As I mentioned previously, I don’t think Geralt has a social anxiety disorder per se, but a lot of his behaviours are consistent with someone who is a little borderline in that regard. Everything in his life revolves around his work, a sphere of his life over which he has complete control and an established reputation, meaning he can worry less about being the Odd Man Out. It also means he has an ongoing method for avoiding social and emotional situations, something any self-disrespecting social anxiety sufferer spends half their life trying to accomplish. Everyone Geralt associates with is someone he met through work, because just going out and making friends sounds quite hard. Where relationships are concerned, Geralt is usually a voluntary second banana. He actively seeks out women who are either much more powerful and confident than he is, or are being paid to keep him company. 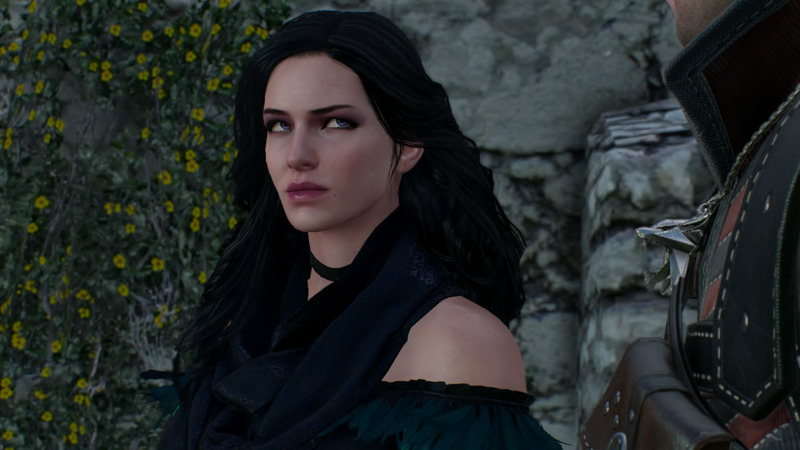 The trail of beautiful sorceresses which appears to beat down the Witcher’s door is comical, but also a little bit sad when you consider how they treat him: as an errand boy, a pretty toy for their personal pleasure, or an amusing decorative item. They’re aggressive, they order him around and they talk down to him whenever possible. And it’s exactly what he wants, because it takes all the pressure off him when it comes to that pesky emotional rubbish. It’s hard to mess up with someone who already treats you so poorly. With that context in mind, his interactions with Shani in Hearts of Stone become particularly poignant. She seems genuinely interested in Geralt, and makes no assumptions about the status of their relationship. She represents the possibility of a normal, equal partnership for Geralt, which includes the possibility that it simply won’t work out (and that it would be Geralt’s fault). When Shani begins casting aspersions on his character, even when its all in good fun, it’s kind of heartbreaking. You can almost feel Geralt worrying that she’ll finally realise he’s a sham of a person who isn’t worth bothering with, and he’ll have to lope back to Yennefer like poor old Charlie Brown. There are also moments scattered through Wild Hunt where Geralt appears to be self-medicating his own lack of social aptitude. Several small events occur around the game world which start with Geralt temporarily dropping his impenetrable mutant emotion shield and sitting down to spend time with strangers around a campfire, usually drinking. Most of these encounters end badly–robbery or murder being the most common conclusions–but he returns again and again, as if the opportunity for a bit of human contact, free from judgement, is worth the risk for him. Early on, you can encounter a merchant in a small village. The place and the person are relatively insignificant, but when you exit the conversation (which was entirely about buying and selling goods) Geralt farewells the swordsmith with the most depressed, defeated, world-weary goodbye you could imagine. At first it seems out of place, he never even asked the man’s name. But it’s a telling moment, where the isolated, solitary and never-ending journey of a witcher seems to finally have gotten to him. Perhaps it’s also a dreadful resignation to the idea that whatever fleeting social interaction Geralt has managed is over, and the cold, indifferent road awaits. Perhaps Geralt wishes he could give it all away, become a merchant and regale his customers with weird and wonderful tales of his past adventures. Parallels between vagrant mercenaries and social anxiety were never what I expected to find in the world of The Witcher, but it is a welcome surprise. Stories which focus on disease, those designed to pick apart mental or physical illnesses are interesting, but ultimately feel a bit too insular and run the risk of dwelling on problems rather than seeking to cope or improve. There is, I think, a benefit to seeing an outwardly successful character dealing with problems that seem painfully mundane yet crippling to sufferers. It reminds us that the people we see around us aren’t always doing as well as we think they are, and that we should avoid comparing ourselves to those unreliable public images. It’s also hopeful; Geralt survives and thrives, carrying on with a career and several long-term relationships, despite not being the best in social matters. Maybe we can survive too.